Explanation: How do galaxies grow? 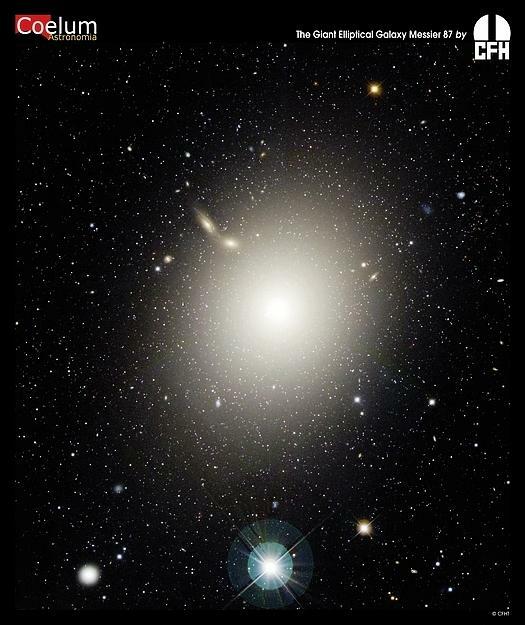 To help find out, the Hubble Space Telescope was deployed to image the unusual elliptical galaxy PGC 42871. How this galaxy came to be surrounded by numerous shells of stars may give clues about how it evolved. Embedded in the diffuse shells are massive globular clusters of stars -- stars which analyses show were born during three different epochs. 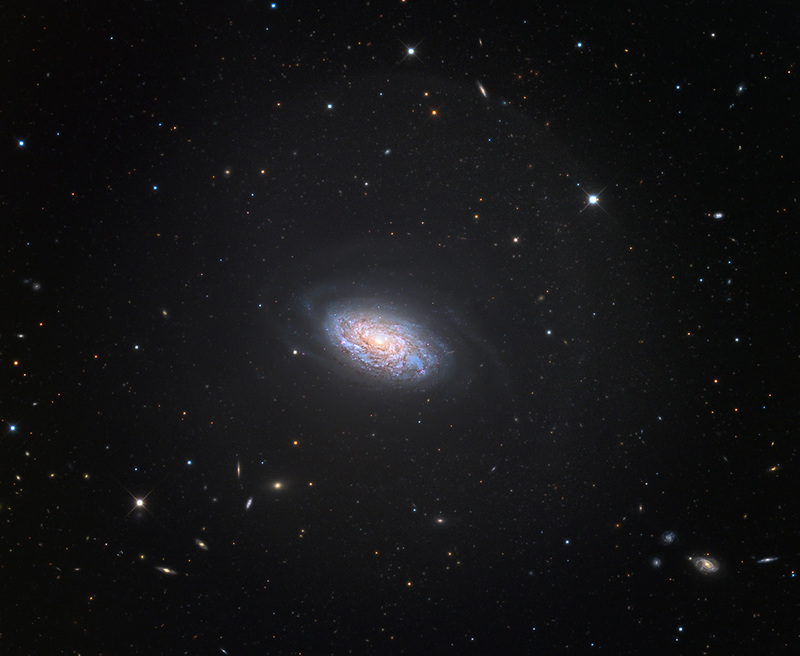 This and other data indicate that PGC 42871 has been in at least two galactic collisions, at least one of which might have been with a former spiral galaxy. The remaining spiral galaxy on the far left is at the same distance as PGC 42871 and may have been involved in some of the collisions. PGC 42871 spans about 20 thousand light years and lies about 270 million light years away toward the constellation of Centaurus. Elliptical shell galaxy NGC 474. A couple of observations here. Shell galaxies are certainly spectacular, and it is a great APOD. Galaxies with numerous shells always seem to be ellipticals. There are spiral galaxies with large, pretty spectacular halos, such as NGC 4414, seen here in a picture by Adam Block. But the spiral galaxies with halos don't seem to have multiple shells. Moreover, the spiral galaxies that have large halos tend to be flocculent galaxies, with numerous short armlets instead of long, flowing arms. The fact only "disturbed" galaxies seem to have multiple shells or large halos does indeed suggest that they are products of either collisions or mergers. Waves lapping on Otama Beach. 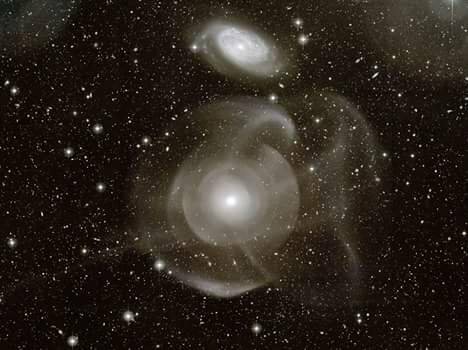 I think of galactic shells or halos as one or a few great "waves of stars" that were caused by a collision or a merger. The shell expanded, taking a lot of stars with it, and then pulled back, but it left stars behind. These left-behind stars make up the shells or the halo. M87 with huge numbers of globulars. Another reflection I have to make is that it is quite hard to spot the globulars of galaxy PGC 42871, the galaxy that is the star of today's APOD. Of course, the galaxy is 270 million light-years away, which should make the spotting of globulars a handful even for Hubble. Or perhaps the globulars show up just fine in the original images, but they are harder to spot in the processed image made for public consumption. Mysteriously, when I look at the large-sized version of today's APOD, I can spot a number of small white spots both inside PGC 42871 and outside it. There definitely seem to be several of them inside the small spiral galaxy at left in the APOD, too. But there also seems to be globulars between these to galaxies, and just generally globulars "in empty space". In other words, the globulars don't seem to be particularly densely packed inside PGC 42871. That makes for a big difference between PGC 42871 and M87 at right. Just look at the profusion of globulars inside this huge galaxy! Then again, PGC 42871 is not a huge galaxy. At all. With a diameter of 20,000 light-years in length, it is rather puny. The shell galaxy in today's APOD would seem to be just a bit bigger than the Large Magellanic Cloud, whose diameter is 14,000 light-years. Of course, if PGC 42871 is a "true elliptical" with a spherical distribution of stars, it is still much bigger than the pancake-flat LMC. Looking at the hiRes version, it almost looks like ripples in a pond after a rock is thrown in. I wonder what is behind this galaxy that we cannot see. Eerie how this galaxy is all white instead of the reds and blues of more younger spiral galaxies. Wonder if a common vernacular name for it would be the Ghost Galaxy. Fitting picture for this time of month being just 2 days away from you know what spooky holiday. Never seen so many galaxies torn apart!!! Look in the back ground once you blow up the image.